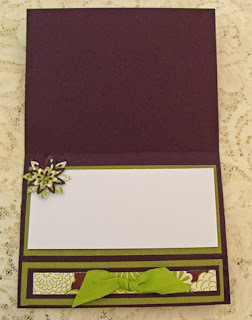 http://christinecreations.blogspot.com/ She showed a layout for a beautiful card. All my sleeping thoughts came together....I was sure I could make a card similar to Christine's with the new papers I'd purchased. 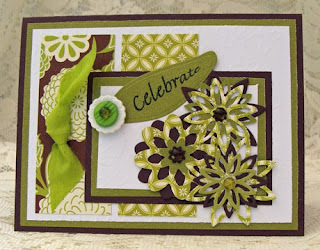 Please stop by Christine's blog to see her beautiful card. I don't know the maker of the solid green, brown or white card stock, but I'm sure everyone can find something that will coordinate with their project. Above I told you about Collage Press and the beautiful card stock. Now let me tell you how I created the card. The card is 5 1/2 by 4 1/4. The layers of card stock are cut 1/4 inch smaller for each layer. The width of the vertical patterned card stock is 1 1/2 inch. I ran the white panel through my Big Shot, using the Sizzix Small Flowers plate. My flowers were cut from BossKut flower dies using scraps from the Seeds Collection of card stock. The word Celebrate was printed onto the solid green card stock using a art font from Print Shop. I then sprinkled embossing powder over the word and heat embossed the word. Using my light box, I lined up the word and using the floral leaf from one of my Spellbinder dies, I cut and embossed the word onto the green card stock. My buttons were layered one on top of the other, and the green center is a green Dew Drop, as are the centers in the 3 card stock flowers. The inside of the card is pretty self explanitory....Before I forget... the ribbon was too wide, so I cut it in half. The only thing left to say is......Thank you Christine! Ooooo, I like this one! Love that shade of green! Will you hold on to it for my birthday...11 months from now?? ;-) Keep up the good work Mom!